All our paintings are 100% hand painted by our artists from sketch to finish, step by step. This canvas wall art are very popular in decoration market. Everfun Art is one of the largest online suppliers of hand painted oil painting on canvas wall art. We provide hand painted modern decoration oil painting, modern painting, abstract painting etc. We as art factory with thousands of decorative oil paintings including modern art, contemporary art, abstract art, famous art, pop art and so on, to satisfy all of your fine art needs. Gallery Wrapped and Stretched on strong wooden stretch frame, FRAMED - Ready to hang for home decorations wall decor, edges are painted, each panel has a black hook already mounted on the wooden bar for easy hanging. Hand Painted oil or acrylic on canvas by our professional artists. This is hand painted oil painting on canvas, it is not a canvas print. 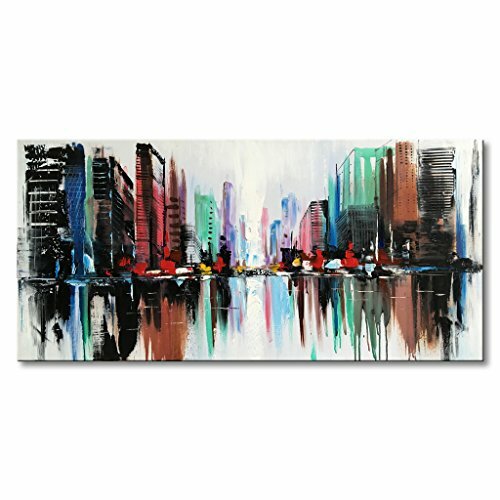 This cityscape canvas painting for living room, bedroom, kitchen, office, Hotel, dining room, bathroom, bar etc. 100% satisfied guarantee. Buy with confidence! Good for wall decor, treasure wall art is great gift for your relatives and friends. Custom size and color are welcome. The pictures show online are taken from actual painting which are made from our studio. If you have any questions about this product by EVERFUN ART, contact us by completing and submitting the form below. If you are looking for a specif part number, please include it with your message.